‘Modern Family’ to put Queensland on World Stage. Hit Comedy Series and Award-Winning Cast to Descend on the Great Barrier Reef. Arts Minister Ian Walker said the production would put Queensland under the international spotlight and provide a significant boost to the state’s tourism and screen production industries. “Modern Family is a hugely popular show and it’s very exciting for our tourism industry to know that places like the Great Barrier Reef and Hayman Island will be seen by millions of people right round the world,” Mr Walker said. Minister Walker said it wasn’t only Queensland’s unique beauty that was attracting international productions. “We’ve been working hard to make Queensland a great place to do business and this deal was made possible through Screen Queensland’s Production Incentive Program,” he said. Minister Walker thanked new Screen Queensland CEO Tracey Vieira for her assistance in getting the contract over the line. Tourism Minister Jann Stuckey said the deal would see images of Queensland reach an estimated audience of 100 million around the world. “This is a fantastic opportunity to showcase Queensland’s destinations and encourage the show’s fans to visit our state,” Ms Stuckey said. The multi-award winning show about the extended Pritchett family – father Jay (Ed O’Neill) and the families of his two children, Claire (Julie Bowen) and Mitchell (Jesse Tyler Ferguson) – has won a total of 65 awards, including a Golden Globe (Best Television Series – Comedy or Musical), four consecutive Emmy Awards and a BAFTA (Best International) in 2012. “Modern Family” is both Network Ten and the ABC Television Network’s top-rated comedy series. 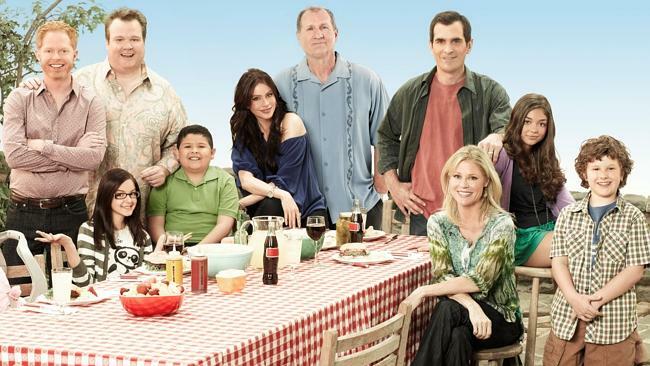 ‘Modern Family’ stars Ed O’Neill as Jay, Julie Bowen as Claire, Ty Burrell as Phil, Sofía Vergara as Gloria, Jesse Tyler Ferguson as Mitchell, Eric Stonestreet as Cameron, Sarah Hyland as Haley, Nolan Gould as Luke, Ariel Winter as Alex, Rico Rodriguez as Manny and Aubrey Anderson-Emmons as Lily. Co-creator and executive producer Steve Levitan, who will direct the “Australia” episode of Modern Family, said the crew was excited about coming to Queensland. “We just had to go to Queensland and the Great Barrier Reef since, like Sofia Vergara, it’s one of the natural wonders of the world,” he said. The series is produced by Twentieth Century Fox Television in association with Picador Productions and Steven Levitan Prods. Steven Levitan and Christopher Lloyd are the creators/executive producers. Danny Zuker, Dan O’Shannon, Bill Wrubel, Paul Corrigan, Brad Walsh, Abraham Higginbotham, Jeffrey Richman and Jeff Morton also serve as executive producers.